Long before strands of twisted wire made fencing affordable and simple for everyone, early pioneers fenced their yards with twisted willow. Settlers pounded sturdy sticks into the ground and then wove flexible green sticks or vines around the wood in patterns. 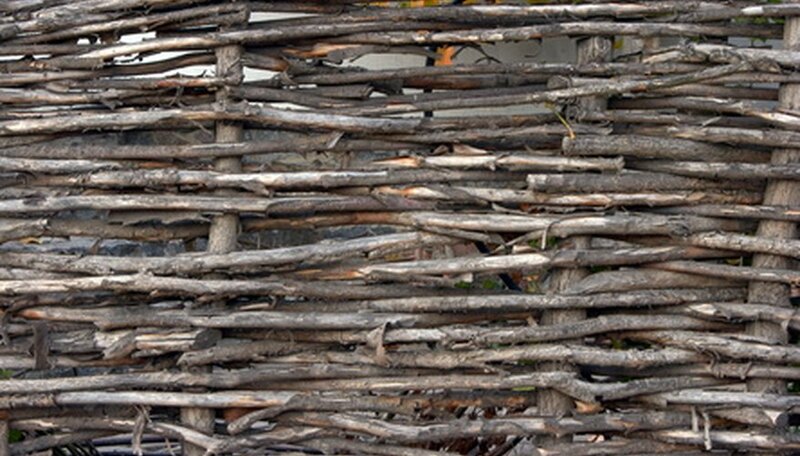 These early fences, called wattle fences, resembled basket weave. Wattle fences were decorative as well as functional. The woven fences could be used to create the walls for early raised beds as well as holding livestock into a pen or away from your vegetable garden. Cut willow branches that are between 1 and 2 inches in diameter and 2 feet longer than the desired height of your fencing. These will be your fence uprights. Saw one end of each branch so that each forms a point. Hammer stakes into the end points of your fence. Tie a string between the stakes to form a guide line to help you erect your fence in a straight line. Place your first post upright with the point aligned downward against the ground next to your stake. Drive the post 2 feet into the ground with the mallet. Space the posts 8 inches apart. Tie the end of a dried grapevine to the bottom of a post with a piece of twine so that 9 inches of vine trails loose. Weave the long end of the grapevine in and out of the upright posts near the ground. When you reach the other end of the fence, wrap the grapevine around the end post 1 turn and weave the vine back and forth between the posts in the opposite direction to build the fence higher. Push the grapevine all the way down the posts toward the ground so that there is no space between the rows of woven grapevine. When you have wrapped 3 to 4 rows of vine, weave and tuck the trailing end of the vine into the basket weave. You can make your grapevine rows snug, or leave gaps between them depending on your personal taste. Weave the grapevine around the posts until the fence reaches the desired height. Tuck the loose end of the grapevine back into the weave. Saw off the tops of the branch posts above the grapevine weave. According to the Washington Post, fence posts made of rot-resistant wood such as cypress may last up to 4 years.